Crude flat prices grew w-o-w as the market shrugged off news of increasing OPEC production in July, focusing on signs of physical tightening. EIA data indicated that US gasoline demand hit a record high of 9.84 mmb/d while crude stockpiles fell by 1.5 mmb/d w-o-w for the fifth consecutive week. ICE Brent front-month futures expanded by $0.52/bbl on the week while Dubai swaps rose by $1.48/bbl. Naphtha cracks in Asia were up on the week on the back of expectations of lower supplies from the West in September as well as firm spot demand in the region. With the upcoming end of peak cracker maintenance season in Asia, the subsequent ramping up of utilization rates is expected to lead to a seasonal uptick in naphtha demand. Asian gasoline cracks firmed w-o-w, supported by the fire at Shell’s 404 kb/d Pernis refinery in Rotterdam, record high US demand as well as stockdraws in various regions. IE Singapore data indicates that onshore Singapore light distillate stockpiles plunged by 10.4% from last week while EIA data showed that US gasoline inventories dipped by 1.1% on the week. Gasoil cracks in Asia surged to around $15/bbl on the back of the fire at Pernis refinery but saw a downward correction towards the end of the week. However, cracks remain at elevated levels as Europe draws diesel cargoes from the US, AG and Asia. Traders have been chartering LR tankers to move middle distillate cargoes to the West. The newly-built Suezmax tanker Chios 1 was placed on subs to ship 130 kt of diesel from South Korea to the UKC with options, loading August 15 at US$1.45 million. Fuel oil cracks in Asia continued their decline from last week, reflecting the growth in crude prices and higher arb arrivals from the West this month. As reported by Reuters, supplies from the West are likely to touch a six-month high of 5.2 mmt. Stale fixing activity as well as fierce owner competition this week has kept the Asian VLCC market in the doldrums. As such, rates for the key AG/Japan route slid by w2 points w-o-w to w47.The battle between handicapped and modern tonnage has intensified with GS Caltex taking a 1999-built vessel at w38 for an AG/Yosu journey, below the psychological mark of w40. In line with the subdued AG market, rates for the key WAF/East route dipped by w2.5 points on the week. Asian Suezmax rates saw some gains over the week on the back of fresh cargoes but a lengthy tonnage list (including newbuilds) and muted VLCC market is expected to limit further growth. Rates for the key AG/East inched up by w3.5 points w-o-w to w71. 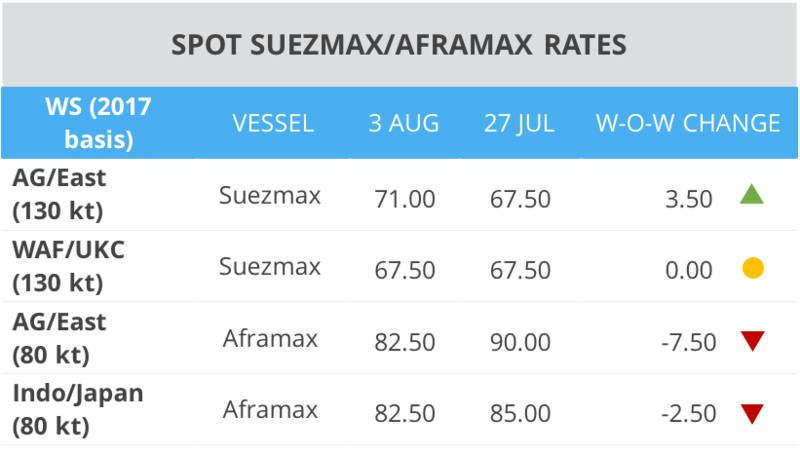 The WAF Suezmax market was flat on the week, with rates for TD20 stable at w67.5. Fixing activity for third decade cargoes was limited, but an active Black Sea market helped to sustain rates. It was a quiet affair for the Asian Aframax market this week with the majority of deals fixed under the radar amidst ample vessel supply. Rates for the AG/East route sank by w7.5 points from last week while rates for an Indo/Japan voyage crept down by another w2.5 points w-o-w. The recent fire at Shell’s Pernis refinery seems to have ignited the Asian LR market, leading to a jump in demand for LR1s and LR2s to carry middle distillate cargoes Westwards. Correspondingly, TC1 and TC5 rates shot up by w7.5 and w12.50 points respectively on the week. Fundamentally, vessel supply for 1H August remains tight with around 5 LR2 and 27 LR1 vessels available for loading in the AG. 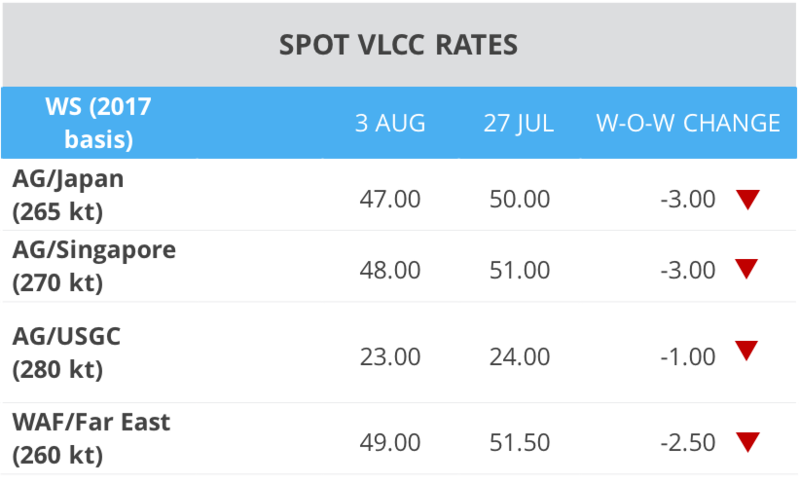 As a few second decade cargoes remain uncovered amidst bullish owner sentiment, we believe that there is potential for LR rates to firm further. MR rates for the key AG/Japan route grew by w3 points w-o-w, in line with the strength in the LR market. Stable demand for moving cargoes to East Africa and the Red Sea underpinned rates as well.